The response to my post from yesterday, “A Negative Tipping Point for FSC Certification,” has been overwhelming. In my 4 years of blogging, it has been far and away the most widely-read and distributed post. Most notably, it was picked up by Ecopreneurist, a leading green business news website, which you can view here. I have received dozens of tweets, as well as messages on Facebook and Linkedin, and virtually every comment has been supportive of my suggestion that FSC’s best days may be behind it in the printing and marketing industries. I welcome your feedback as well! Turning the page on FSC? Over the past few years, awareness has grown about FSC-certified papers and printing. 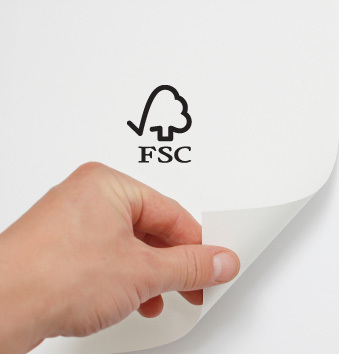 FSC stands for Forest Stewardship Council, a group that works to ensure that the materials used are sourced responsibly. Each step in the chain (i.e. from forest to printer) must be traceable. The intent of the FSC system is to eliminate habitat destruction, water pollution, displacement of indigenous peoples and violence against people and wildlife that can accompany logging. Although I believe this is a meaningful cause, I wanted to report to my readers that I believe that FSC certification in the commercial printing and marketing communications industry has hit a negative tipping point. By this, I mean that the future of FSC certification in these fields is murky at best. Lack of awareness of what FSC means. As I mentioned before, FSC is a system designed to ensure the chain of custody of paper, from when it was a tree to its final printed form. The fact is, many people in our industry do not know what FSC is, and therefore do not sell it. More importantly, I have seen many research studies that show that most consumers do not know what it means and are therefore not interested in it. Lack of tangible environmental benefit versus other green attributes. When people use recycled paper, they know they are consuming less natural resources than they would if they chose virgin fibers. Vegetable-based inks sound like they make a positive difference, as they cut down on the use of oil, and are renewable. Papers made with renewable energy send a message that an organization wants to reduce its carbon footprint and support a green economy. Those terms, recycled, vegetable-based, and renewable energy, all are easy to understand and therefore end consumers of print and marketing collateral feel comfortable around these terms. If they feel comfortable around these terms and believe they know what makes them green, they will continue to ask for papers and printers that meet these standards. FSC, on the other hand, is difficult to understand, and the green attributes may not be immediately obvious. The combination of the difficult economy and the perceived greed of the Forest Stewardship Council. It is not surprising that FSC grew dramatically in 2007 and 2008, when the broader economy was stronger, and the environmental movement was top of mind. However, as printers fell on tough times, FSC continued to charge large annual fees from printers to allow them to maintain their individual plant certifications. One printer told me the following: “Look, I’m a small company – we do $3-$4 million in sales per year, and when I had to sign up for FSC certification in 2008, and spend $10,000-$15,000 to make this happen, with ongoing overhead expenses, I did it. I thought it would be a cost of doing business, and that I would lose business from eco-minded clients if I wasn’t FSC certified. When sales fell in 2009 and 2010, I appealed to FSC to get a reduction in my fees, as I was facing the choice between paying my FSC bill or my payroll. FSC wouldn’t budge, so I didn’t renew, as I was more interested in protecting my employees than I was in paying what I saw as an FSC tax. I haven’t noticed a sales drop off due to this decision.” After hearing this, I spoke to several other printers, many of whom no longer maintain their FSC certification, as they said the costs outweighed the benefits. Some questioned the mission of FSC, with one saying it seemed to be an “overhead-heavy organization” that “charged small printers large fees to pay for their bloated staff.” I found this large organizational chart on their website which did not contradict this assertion. In some sense, printers have been FSC’s sales force. Once printers became certified, they sold FSC as an incredibly valuable brand, and one that all companies that wanted to send a green message should strive to put on their printed pieces. Now that many of these smaller printers have declined to renew, FSC has lost a powerful constituency that will not continue to spread the word about FSC. One other constituency FSC has partially alienated is designers, due to their strict rules around usage of the term “FSC.” Several years ago, if an organization wanted to explain their green choices with words instead of symbols, they were allowed to do so. As an example, if they printed a brochure on Neenah Environment PC 100, one of my favorite green papers made from 100% post-consumer recycled content, at an FSC-certified printer, they could use a simple sentence like “Printed using FSC-certified 100% post consumer recycled content.” Now FSC no longer allows this, and insists that the term “FSC” only be used along with its official logo. FSC is clearly trying to build awareness of its brand, but this shouldn’t be the responsibility of the end user. I have seen this rule cause designers to sacrifice the use of the “FSC” term. FSC is a worthwhile organization, and serves a good cause. However, I believe its lack of obvious green benefits relative to other green elements like recycled paper is hurting adoption. More than that, however, are the large fees charged to FSC’s sales army (printers) during this recession. Those, coupled with strict rules around design, are a sign that FSC may have overplayed its hand in the marketing communications industry, and its best days are behind it.